On to the polish. 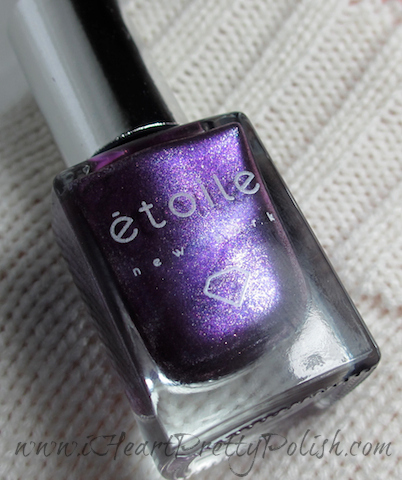 This is my first Etoile polish and it's called Urban Violet. Here is Etoile's description of Urban Violet: "In spring, flowers will grow...even in concrete gardens. Urban Violet is a royal purple that's fiercely feminine - for the woman who blooms anywhere you put her." This purple is sooo pretty! After reading more about Etoile polishes and the creator (read here) - I discovered that each polish is infused with genuine diamond dust. That probably explains the higher than average price tag of $18. But I think it's worth it. This brand is new to me - I found out about it when someone posted a special from Living Social where you choose a 3-pack for $27. Now they are back to $57 for the same 3-pack:( I bought this one and am excited to show the other two to you. I already wore the mint one and loved it. I wore it for 4 days of getting ready for a party, decorating a cake, cooking, cleaning, and traveling...and it didn't chip at all. Have you ever heard of this brand? If not, check it out - I bet one of the beautiful polishes will catch your eye:) They ALL catch my eye. You can also sign up to be on their mailing list to receive special offers. Auuuugh that is gorgeous!If you had to choose between this, BL Pitter Patter, and Illamasqua Baptiste which would you choose? Wow, that's a tough one. 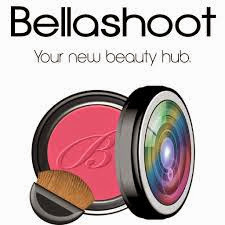 I think I would pick Illamasqua Baptiste and this would be a close second. This is so beautiful and shimmery! I've never heard of this brand! That is one gorgeous purple. I think I've heard of this brand before but I've never tried it! This shade looks lovely! I know, hopefully they have more deals like that soon. I know, I need to start wearing some different colors. I'm drawn to purples and greens! It's super pretty but I'm not sure how I feel about the diamond dust polish trend (OPI DS, Deborah Lippmann, Etoile...). I can't really tell a difference between the formula of my DS and non-DS holos. How would you say the formula of the Etoiles compare to the DS collection? I think it's comparable to the OPI DS polishes as far as formula goes. This does have some dimensional shimmer, but it's not holographic at all. Thanks for stopping by! I know the finish of the Etoile isn't holographic, I was wondering because OPI now has the shimmer finishes that look similar. Thanks! Have you tried Posh Bird yet??? Yup, I'm sure more of my money will be bidding me "bye bye" as well, courtesy of this post! ;-) What a stunning shade!! :-D I seriously can't believe how immaculate your swatches are...as careful as I am, I always end up flooding my cuticle in one area, and it turns out to be impossible to clean up. Agggh. I applaud you! Hi Essie, wowzers!!! I call this a true Essie shade!!!! I have 't heard from this brand either but your pictures are so beautiful, that one can actually "see" the diamond dust!!! Also here in Switzerland we were deeply shocked by the Tornado in Oklahoma and our hearts and out thoughts reach out to its victims! I was wondering if you hear about news in the US. Yes, that is so scary and horrible:( Thanks for commenting! I have been lemming the minty one from the spring collection-but the price kept me from buying it! This purple is stunning! Oh and BTW, I sent you an email yesterday in response to your comment on my blog. Just making sure you got it! Yes, the minty one is so pretty. It's not as opaque, but it's worth it. Actually, I'm stupid-wrong blog! I'm fighting a cold and my mind is already on vacation!!! I'm so sorry! Still love the purple though!! !